This is a good way to find topic for write a blog post. You can visit your competitor or same niche websites for see their latest post, categories. You will get knowledge, what is the topic people always looking for. I’m not saying, visit your competitor blog and copy their articles. I’m only saying to visit your competitor website or blog for collect knowledge about their latest post and start writing with your own ideas. Note: Don’t copy other blog’s content, don’t spinning post. 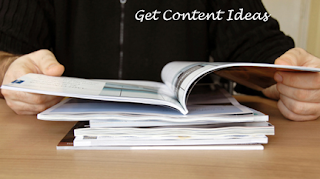 Hope you will get too many content ideas for writing blog posts. Most of people think it’s not a strategy to get content ideas. But believe me, it’s really effective way to find a good and best topic to write article for your readers. What you need, you need some friends on social sites, forums or etc. You can also build a group for communication with your friends. You can know what other peoples are thinking. You can do this step if you are facing problem about content ideas. Traffic is the main part of blogging to make your website running. If your readers can’t find a topic they are looking for. They will leave your blog for sure. So you can get knowledge about content what they are looking for or you can ask your readers. If your readers see your blog is really helpful for them, they will obviously become your regular visitors. So make them happy and get good feedback. People always like to make a discussion or communication with popular blogger’s who success in blogging career. Make questions lists for get answers from interview person. You will get more and valuable knowledge about blogging career from them. Reading other blog’s content and learns from them. How they write attractive content for their readers, what’s the technique they are using? How many articles you read, more you can learn from them. It’s also helping you to choose a blog post title for your blog and write useful content with good presentation. When you have no idea or topic for write content to you blog, then review will help you a lot. Just pick a good product or review and start typing with their positive and negative benefits. What you recommended or what you dislike most. You can write big reviews about a product easily. You can walk and finding topic about your blog niche. When I’m facing the same problem, I always relax and keep a small rest. Then I got some great idea for my readers, they always like it. I know it takes some time to thinking about a topic, but it’s really effective way to write content for your blog and get amazing ideas. Write something how to make your blogging career, how you success in this life, what you are doing, what’s the best secrets, from where you learned blogging. People always like to read professional blogger’s real life and its inspiring most of readers who are reading your post. You can create lists of your old posts in one page. It’s really helpful for all new visitors who come to your blog. They can easily see your old blog posts by clicking the page. On the lists of old posts, you may tell what you were thinking, when you wrote the post and etc. I’m not telling those are the only way to get content ideas. I shared some strategy, who are facing problem with writing content. You can follow all way when you are on problem. Best of luck. Yup bro, I'm totally agree, I'm not good in English. But practicing is the best way to improve my English language. :) Thanks for your comment. SBI Human Resource Management System has also given the SBI HRMS Holiday Calendar in hrms.onlinesbi.com. Actually every year holiday's list will be released in the first month of the year.